Ageratum Blue Mink Ageratum Houstonianum is a compact annual with a dense growth habit. Also called Floss Flower this splendid dwarf plant is easy to grow from seeds. 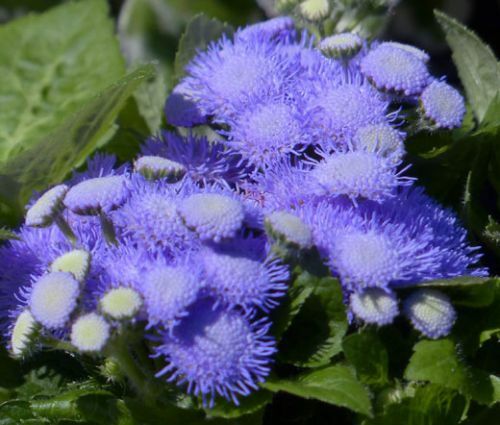 Ageratum Blue Mink has attractive foliage with oval, downy, heart-shaped leaves and produces rounded clusters of powder-blue flowers with a pronounced pincushion effect. The soft fuzzy flowers are dainty and feathery, and they usually completely cover the plants. Ageratum blooms from midsummer until first frost. Floss Flower is extremely versatile, and it is ideal for bedding displays or as a potted plant. The size and color makes this Ageratum a good candidate for rock gardens, flower beds, and containers. Ageratum Houstonianum likes to grow in full sun or partial shade and prefers moist, but well-drained soil. Ageratum is an excellent plant for beginner gardeners.